Image 1: The last installment was all about avoiding artificial light, today we will use it to our advantage. In the last installment of the SuppVersity Circadian Rhythm Series, we have taken a brief look at some of the physical aspects of light, in general, and how they relate to the physiological effects sunlight and artificial light exert on our biological clock. We have identified the omnipresence of unnatural "light" (in the broadest sense) in our 24/7 x 365 world as one of the, if not the most important reason that our natural circadian rhythm and all the metabolic and endocrine parameters that depend on it got out of balance and we have discussed a couple of things that could be useful for anyone to either regain or retain the natural rhythm our genes have evolved with. In today's installment we are now (figuratively) turning back the time and take a look at the beneficial effects the same light(s) that keep(s) us awake, when we are long supposed to sleep, can have on the accuracy of our biological clock, earlier in the day. Now, that the day's are long and the sun is up or at least about to rise, when we are making our way to the bathroom to shower, brush our teeth, brew our coffee and grab something to eat (or continue our fast) before we pour ourselves into our daily business, many of you may already have forgotten those dark winter days, when you leave the house in darkness and sit in the office all day and are happy to see the last rays of the sun, when you jump into your car and head home, to the gym or to wherever you may be going on an "afternoon", your body can hardly distinguish from the darkest night. Image 2: Selected physiological functions and their circadian pattern (Richter. 2011). Before we are digressing any further into philosophical consideration, let's take a more scientific 2nd look at the enlightening (all puns intended) connection between the "winter blues", obviously a matter of circannual rhythmicity, and its high(er)-frequency equivalent the 'daily affective disorder'. The collage of data and illustrations I have come up with in figure 1 should actually make it pretty obvious: Despite the fact that the term 'circadian affective and physiological disorders' I have already used in the caption of this paragraph does not exist, the symptoms by which it makes itself felt, the sleep problems, the ravenousness, the depressive undertone, the lethargy, the tiredness, etc. are virtually identical. 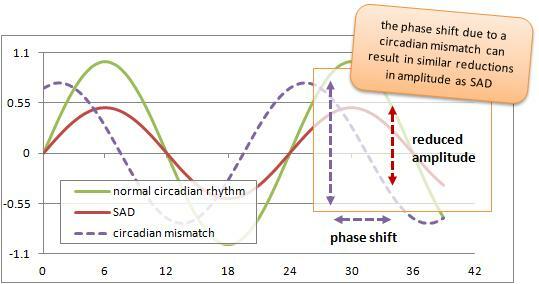 Figure 2: Illustration of normal circadian rhythmicity (green), in seasonal affective disorders (SAD, red) and a circadian mismatch due to a phase-shift (violet); the units are more or less arbitrary. In the end, you could probably argue that "SAD" is nothing but the "natural" accumulation of a light debt and results in a similar suppression of the natural amplitude (= degree of ups and downs, figure 2, green) of the circadian rhythm as a mismatch of the internal clock with external time emitters, above all the light of the sun. Despite the fact that the outcome of seasonal depressive disorders, on the one hand, and the downstream effects of permanent "social jet lag", or other misalignments of your biological clock and the "social time" you are living in, on the other hand, are in fact almost identical, the classic "winter blues" is the result of simple light deprivation, while the more complex pattern of circadian disorders has an intensity and a phase component and will necessarily have to be fixed differently. What chronotype am I? Find out and become a part of a scientific study! While it is unquestionably possible to come up with an indefinite number of "classes" between the classic "early bird" (=person who raises with or before sun rise) and the "owl" (=person who rises, when the birds are having lunch), the scientific branch of chronotyping, which is occupied with the study of human rhythms in behavioral and cognitive functions, has come up with (you guessed it) a standardized questionnaire, the "Munich Chronotype Questionnaire", you can fill out here and will receive a "personal profil" via email. If you don't want to wait or don't trust the German researchers, you can also download the modified Horne-Östberg Questionnaire, here. When you've filled it out, you will be able to calculate your "Morningness Eveningness Score." Based on that score you can then locate your suggested starting time in figure 4. The respective recommendations are based on a paper by Terman from 2005 and have been developed for SAD, so take them as what they are guidelines, not rules! While research suggests that the correct timing of light exposure/therapy is of little or no importance as far as its beneficial effects on depression scores are concerned (Wirz-Justice. 1993), the so-called "circadian phase-delay", as scientists refer to the "time-shift" between natural and social clock (see figure 2, violet), must not be ignored if you intend to realign or protect yourself from future misalignment of your social and biological time domains. The situation in figure 2 (violet), for example, depicts a ~4h phase shift, which would get you up and out of bed with the dreaded "2-AM wake-up call" (by the way pretty common in people who overtrain), 4h before your time! Now what can you do to battle this problem? Get out of bed switch on your 10,000 lux light therapy lamp, log on to facebook, check a couple of emails and sip a strong coffee? If you want to and can afford to be back to bed at 6 PM, go for it. If you don't you better stay in bed (and in the dark! ), get up as you would "like" to and take a 30min "light shower" 1-2h after the time your morningness-eveningness score would dictate (see infobox "What chronotype am I?") This will help you to push the onset of melatonin release gradually backwards until you reach the point, where it is ~8.5h before your "optimal" or necessary wake-up time. For someone with an MEQ score of 45 who would ideally get up at 7 AM but won't make it to the office in time if he isn't up at least 1h "before his current time", on the other hand, a different strategy would be necessary. Instead of turning around and sleeping the day away, he would set the alarm clock ahead by about 1h, jump out of bed at 5:00 AM, get his 30 min of bright light therapy in front of his 10,000 Lux lamp and do his regular morning routine afterwards. As soon as it becomes easier to get out of bed, it's time to set the alarm clock to 5:30 AM and eventually to 6:00AM. It should be obvious, that even that will never be optimal for someone who is a born owl, i.e. a person whose genetic clock is set to wake him up, when the rest of the world has just had lunch. The daily and most importantly regular, early and intense light exposure in the morning is going to help him to get out of bed easier and it will also increase his chances that the earlier onset of melatonin production combined with the tricks I have outlined in the last installment of this series allow him to fall asleep in time and get his 7-9h of sleep before the next light therapy session. Warning: Guidelines and examples are no blueprints! These examples, as well as the figures in the infobox on chronotypes are very broad recommendations! You won't be able to avoid experimenting in order to pinpoint the optimal regimen for you. Ok, I am convinced, what device shall I get? What's that Valkee device? Is that any good? While there is a sponsored study on the efficiacy of the Valkee bright light device a "plug in your ear" light therapy device, the study is uncontrolled, which renders is more or less impossible to say how much of the observed beneficial effect the scientists measured by two different tests (HAMD-17 & BDI-21) were simply the result of a placebo effect (Timonen. 2012). This does not mean that this device does not work, it just means that light therapy through the eyes is a well-established method not just to treat depressive disorders, but also to reprogram your circadian rhythm. The Valkee, on the other hand, could be a mobile and thus very convenient alternative (or adjunct) to the classic devices. It does yet still lack credible independent research that would prove its effectiveness - something like the 1993(!) study by Meesters et al. I picked as a comparison and in which only 4 days of light therapy with a classic 10,000 lux lamp had slightly more pronounced effects than the Valkee, even 10 days after the therapy had ended (see figure 3; note: It must be said that this is at best a binary comparison, because a quantitative comparison of the study outcomes from these studies can would at best serve as a basis for a hypothesis that would then have to be verified in a future trial). a 10,000 lux full natural daylight spectrum white energy lamp or light therapy device, which will provide the full natural spectrum (you remember that's the sum of all frequency components of the sunlight, see figure 2 in the last installment) without the potentially carcinogenic UV part - I don't have to tell you that this implies that you won't get tanned, right? According to the claims of the producers of such devices the blue light allows for shorter exposure times to achieve the desired effects. This assumption does unquestionably seem reasonable, but the same is true for the hilarious notion that eating more protein will make you gain proportionally more muscle or that the presence of cholesterol in arterial plaque would verify that cholesterol is the cause of heart disease. Independent and controlled large(r) scale trials to support these claims are yet scarce and in the case of an even more innovative device, the fancy Valkee "brain stimulation set" that's supposed to shine light through your ears onto the recently discovered light sensitive proteins in your brain (for more info on the Valkee, check out the infobox on the right and the website of the producer), simply non-existent. I personally did therefore decide to buy a classic white energy light system, also in view of the fact that you can simply place it right next to you at the breakfast table, the newspaper, your computer screen or wherever you want during your morning "circadian rhythm hacking sessions" *rofl* - this is by the way I use my device - at least if the weather / season / my wake-up time doesn't allow me to use the sun instead; and believe me, the blue light or Valkee could hardly be more convenient. Time of day for application In 90% of the cases the morning is the best time to apply light therapy; different rules do apply if you have to adapt your biological clock to a totally unnatural social rhythm, as it would for example be the case if you work night-shifts. In case of non-response double-dose, if you feel sleepy before your time; start earlier or add melatonin (3-10mg) before bed, if you can't get to bed in time. Other than that, Terman & Terman mention in a 2005 review paper that in their trials on patients with all sorts of serious psychological disorders, like manic depression or bipolar disorders, it was often necessary to increase the dosages, both time- and intensity-wise slowly to avoid flare-ups of these pre-existing problems. Compared to your average energy drink, let alone pill, the 30-min in front of a light therapy lamp are yet still child's play... its effects on the other hand are longer lasting and way more far-reaching. A sneak peak on the next installment: In the next installment of the Circadian Rhythm Series we are going to leave the light out, only literally, of course, and devote ourselves to such profane things as food, what your biological clock tells you about when and what to eat and which effects this can have on your physique, performance and overall health. Baroni BM, Leal Junior EC, Geremia JM, Diefenthaeler F, Vaz MA. Effect of light-emitting diodes therapy (LEDT) on knee extensor muscle fatigue. Photomed Laser Surg. 2010 Oct;28(5):653-8. Epub 2010 Jul 13. Blouin AG, Blouin JH, Iversen H, et al. Light therapy in bulimia nervosa: a double-blind, placebo controlled study. Psychiatry Res. 1996;60:1 9. Braun D, Sunday S, Fornari V, Halmi K. Bright light therapy decreases winter binge frequency in women with bulimia nervosa: a double-blind, placebo controlled study. Compr Psychiatry. 1999; 40:442-8. Howland RH. An overview of seasonal affective disorder and its treatment options. Phys Sportsmed. 2009 Dec;37(4):104-15. Lam RW, Goldner EM, Soplyom L, Remick RA. 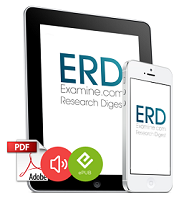 A controlled study of light therapy for bulimia nervosa. Am J Psychiatry. 1994;151: 744-9. Meesters Y, Jansen JH, Beersma DG, Bouhuys AL, van den Hoofdakker RH. Light therapy for seasonal affective disorder. The effects of timing. Br J Psychiatry. 1995 May;166(5):607-12. 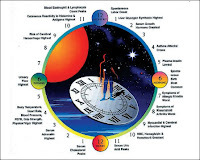 Reiter RJ, Rosales-Corral S, Coto-Montes A, Boga JA, Tan DX, Davis JM, Konturek PC, Konturek SJ, Brzozowski T. The photoperiod, circadian regulation and chronodisruption: the requisite interplay between the suprachiasmatic nuclei and the pineal and gut melatonin. J Physiol Pharmacol. 2011 Jun;62(3):269-74. Terman M, Terman JS. Light therapy. In: Kryger MH, Roth T, Dement WC, eds. Principles and Practice of Sleep Medicine. 4th ed. Philadelphia, Penn: Elsevier; 2005:1424-1442. Terman M, Terman JS. Controlled Trial of Naturalistic Dawn Simulation and Negative Air Ionization for Seasonal Affective Disorder. Am J Psychiatry. 2006; 163:12. Timonen M, Nissilä J, Liettu A, Jokelainen J, Jurvelin H, Aunio A, Räsänen P, Takala T. Can transcranial brain-targeted bright light treatment via ear canals be effective in relieving symptoms in seasonal affective disorder? A pilot study. Med Hypotheses. 2012 Apr;78(4):511-5. Wirz-Justice A, Graw P, Kräuchi K, Gisin B, Jochum A, Arendt J, Fisch HU, Buddeberg C, Pöldinger W. Light therapy in seasonal affective disorder is independent of time of day or circadian phase. Arch Gen Psychiatry. 1993 Dec;50(12):929-37.